﻿Rev. Brian Glenn and Travis Plementosh are in Need of your help. Our Lord and Lady of the Trinacrian Rose Church (a.k.a. Trinacrian Rose Church) is an Earth-Centered church based in Salem, Massachusetts (USA). We are recognized as a 501(c)3 tax-exempt church under the Internal Revenue Service (IRS) Codes as amended, and organized under Massachusetts General Law Chapter 180 as a religious society/church. Our membership extends throughout the USA & abroad. Please see our News and Updates link for our most recent announcements. 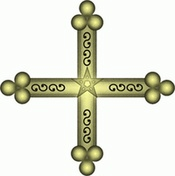 The Trinacrian Rose Cross, the symbol of our church is Trademarked (tm) & Service Marked (sm) by Rev. Lori Bruno. Display or usage of this logo in any form without express written consent is prohibited by law.